To evaluate visual and refractive outcomes of small incision lenticule extraction (SMILE) for hyperopia. This prospective study of vertex-centered hyperopic SMILE used the VisuMax femtosecond laser (Carl Zeiss Meditec, Jena, Germany). Inclusion criteria were maximum attempted hyperopic meridian of between +1.00 and +7.00 diopters (D) and corrected distance visual acuity (CDVA) of 20/40 or better. Lenticule parameters were 6.3- to 6.7-mm diameter, 2-mm transition zone, 30-µm minimum thickness, and 120-µm cap thickness. Standard outcomes analysis was performed for the 3-month data, including contrast sensitivity using the Functional Vision Analyzer. For 93 eyes treated, 3-month data were available for 82 (88%). Attempted spherical equivalent refraction was +5.62 ± 1.20 D (range: +1.00 to +6.90 D) and cylinder was −0.91 ± 0.68 D (range: 0.00 to −3.50 D). For eyes targeted for emmetropia (n = 36), uncorrected distance visual acuity was 20/40 or better in 89%. Spherical equivalent refraction relative to target was −0.17 ± 0.85 D (range: −2.20 to +3.00 D), with 59% within ±0.50 D and 76% within ±1.00 D. There was one line loss of CDVA in 17% of eyes, and one eye lost three lines (1.2%) but recovered to one line lost at 9 months. There was no clinically significant change in contrast sensitivity. Refractive and visual outcomes 3 months after SMILE for hyperopia were promising, given the high degree of hyperopia corrected and relatively reduced CDVA in this population. Undercorrection of more than 1.00 D in 5 eyes might be partly explained by latent hyperopia in these young patients. The second safety factor to be considered was achieved optical zone diameter and spherical aberration changes, given the well-known detrimental effect of small optical zones and high spherical aberration in terms of regression and quality of vision.6 The topographic optical zone after SMILE with a programmed optical zone of 6.3 to 6.7 mm (and 2-mm transition zone) was found to be similar to 7-mm LASIK and larger than 6.5-mm LASIK. Consequently, the induction of spherical aberration for 6.3- to 6.7-mm SMILE was similar to 7-mm LASIK and less than 6.5-mm LASIK. The aim of the current study was to report the refractive and visual outcomes for hyperopic eyes treated by SMILE in sighted eyes. Ethics approval was obtained from the Nepal Health Research Council for this prospective case series of consecutive hyperopic SMILE procedures by three experienced surgeons (KRP, DZR, and GIC) using the 500-kHz VisuMax femtosecond laser (Carl Zeiss Meditec, Jena, Germany) at the Tilganga Institute of Ophthalmology, Kathmandu, Nepal. Inclusion criteria were attempted correction in the maximum hyperopic meridian between +1.00 and +7.00 diopters (D), astigmatism up to 6.00 D, medically suitable for SMILE, normal corneal topography, and no ocular disease. Inclusion criteria were corrected distance visual acuity (CDVA) of 20/200 or worse for phase I, 20/100 and 20/200 for phase II, 20/40 and 20/80 for phase III, and 20/40 or better for phase IV of the study. Phases were advanced once safety had been demonstrated for the previous group. Patients treated as part of phase IV between May 2014 and February 2017 were included in the current study. A complete ophthalmologic examination was performed prior to surgery by an in-house optometrist, as has been described previously.5–7 The preoperative examination also included corneal Placido topography by ATLAS (Carl Zeiss Meditec), corneal tomography by Pentacam (Oculus Optikgeräte, Wetzlar, Germany), corneal tomography and epithelial thickness mapping by RTVue optical coherence tomography (Optovue, Inc., Fremont, CA), pupillometry (VIPTM-200; Neuroptics, Irvine, CA), and handheld ultrasound pachymetry (SP-3000; Tomey Corporation, Nagoya, Japan). Refractions were done by the in-house optometrist at the first visit, including both a manifest and a cycloplegic refraction, performed according to the standardized London Vision Clinic protocol to push maximum plus and maximum cylinder.8 The manifest refraction was repeated by the operating surgeon at a second visit on a separate day with the aim of pushing maximum plus with the knowledge of the cycloplegic refraction. This manifest refraction was used to plan the treatment. Contrast sensitivity was measured using the Functional Acuity Contrast Test (FACT; Vision Sciences Research Corporation, San Ramon, CA). The following criteria were applied for planning the procedure. First, the predicted postoperative residual stromal thickness under the lenticule must be greater than 250 µm at the location of maximum tissue removal. Second, the attempted correction was limited such that the predicted postoperative keratometry was less than 51.00 D, calculated using the manifest refraction at the corneal plane added to the preoperative keratometry at the axis of treatment by vector analysis. Finally, an arbitrary maximum attempted correction of +7.00 D was applied. Therefore, some young patients were treated as a partial correction to debulk a high hyperopic refraction. All SMILE treatments were performed using the 500-kHz VisuMax femtosecond laser as described previously.5,9 In all eyes, two incisions were created: a 2-mm incision superonasally and a 2-mm incision superotemporally. Intended cap thickness was 120 µm in all eyes. Cap diameter used was 8.8 mm in all eyes, using a medium (M) contact glass. Optical treatment zone diameter was between 6.3 and 6.7 mm, with a 2-mm transition zone. The minimum lenticule thickness was 30 µm in all eyes. The spot and track distance were 4.6 µm for the cap and lenticule interfaces, 1.5 µm for the lenticule side cut, and 2 µm for the small incision. The energy level was set to 34 (170 nJ) in the VisuMax software. The surgical technique was essentially identical to that used for myopic SMILE, as has been described previously.5–7,9 The treatment was centered on the coaxially sighted corneal light reflex, confirmed by the surgeon by comparing the relative positions of the corneal reflex and pupil center to the Placido eye image obtained by the ATLAS topography scan. The femtosecond laser cutting for the hyperopic lenticule was performed as previously described.2,3,5,6 The lenticule dissection was performed as described previously5–7,9–11 using the MMSU1297 Reinstein lenticule separator instrument (Malosa Medical, Halifax, United Kingdom). The lenticule was then hydrated with balanced salt solution on the corneal surface to distend it for visual inspection for completeness and edge smoothness. Outcome analysis was performed according to the Standard Graphs for Reporting Refractive Surgery.13 Eyes where the intended postoperative refraction was not emmetropia (partial correction patients) were excluded in the efficacy analysis. Vector analysis was performed for refractive cylinder as described by Alpins,14 with the cylinder axes reflected in the vertical meridian for left eyes. Student's t tests were used to calculate the statistical significance of any changes in log contrast sensitivity. Microsoft Excel 2010 software (Microsoft Corporation, Seattle, WA) was used for data entry and statistical analysis. A P value of less than .05 was defined as statistically significant. A total of 93 eyes of 62 patients underwent hyperopic SMILE between April 2014 and February 2017, of which 3-month data were available in 82 eyes of 53 patients (88% follow-up). Table 1 shows the demographic data for the study population. The population was skewed toward young patients with high hyperopia due to the nature of the refractive error distribution in Nepal, where there are few patients with low to moderate hyperopia. The optical zone was 6.3 mm for 35 eyes (43%), 6.5 mm for 46 eyes (56%), and 6.7 mm for 1 eye (1.2%). The maximum lenticule thickness was 153 ± 26 µm (range: 54 to 180 µm). 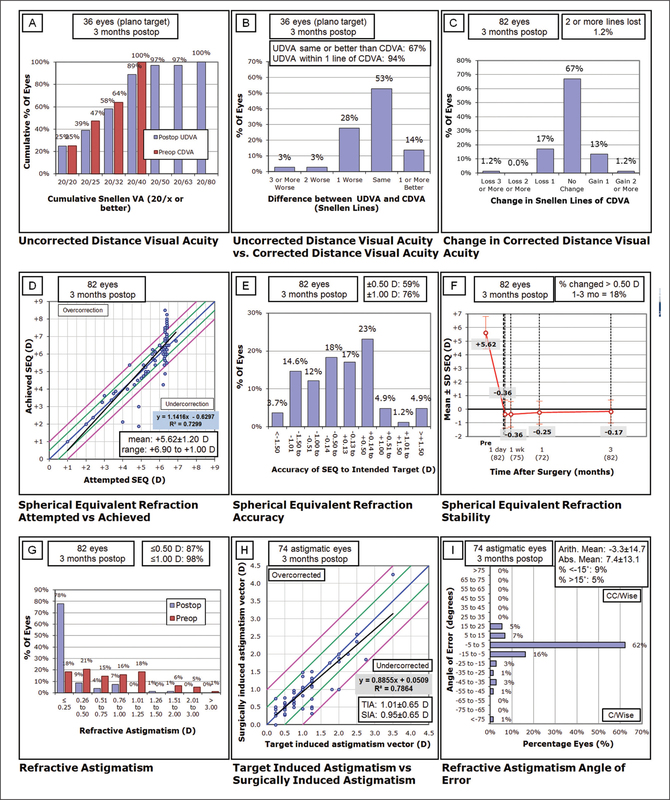 Figure 1 shows the Standard Graphs for Reporting Refractive Surgery. Uncorrected distance visual acuity (UDVA) was 20/32 or better in 58% of eyes, relative to 64% with preoperative CDVA of 20/32 or better. Spherical equivalent refraction was within ±0.50 D in 59% and within ±1.00 D in 76% of eyes. There was one line loss of CDVA in 17% of eyes, and one eye (1.2%) lost three lines but recovered to one line lost at the subsequent 9-month visit. 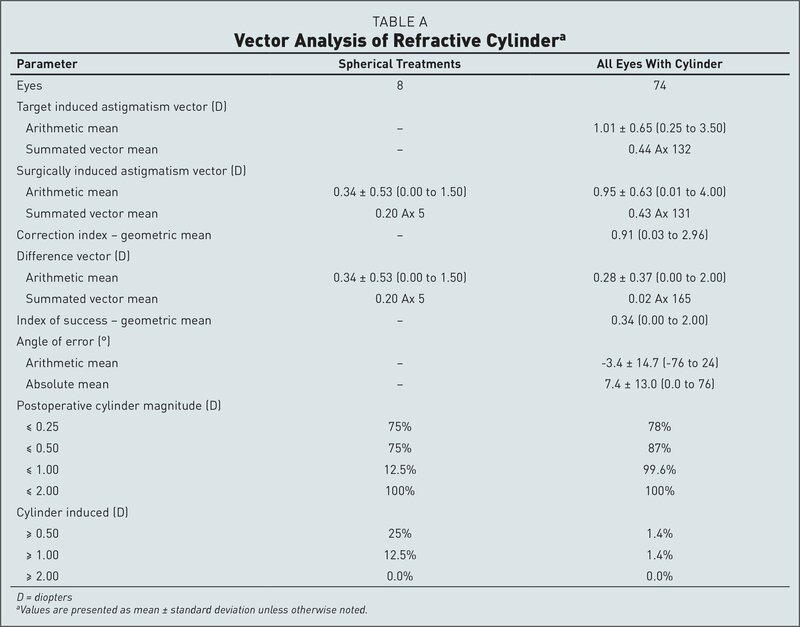 Figure 2 shows the vector analysis for refractive cylinder and the main outcome measures are shown in Table A (available in the online version of this article). 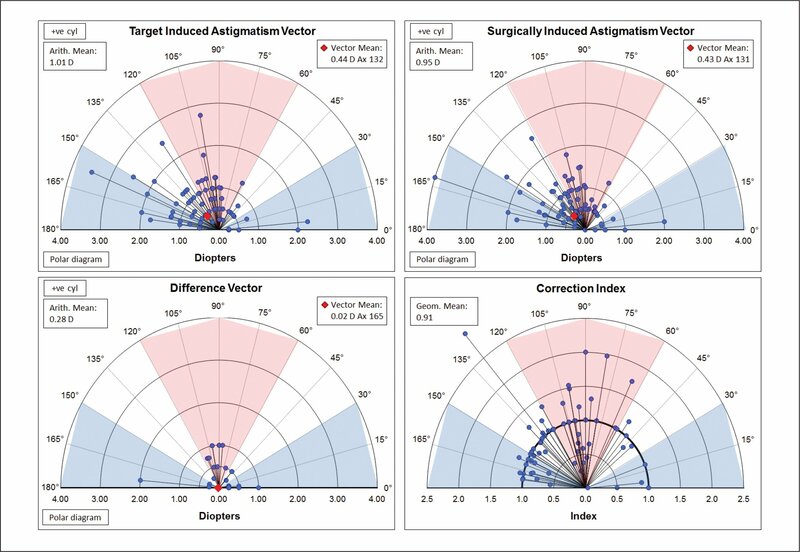 The scatter plot for surgically induced astigmatism vector (SIA) versus target induced astigmatism vector (TIA) shows that the refractive cylinder correction was on target in terms of magnitude. The angle of error histogram shows that the refractive correction was placed accurately on the intended meridian for the majority of eyes, with 86% within ±15°. There was one eye where the angle of error was 76°, indicating an induction of refractive cylinder from −1.00 × 168 to −2.00 × 175. On reviewing this case, the preoperative corneal astigmatism was 2.64 D @ 79°, so the apparent induced refractive cylinder may have been an underestimation of cylinder in the preoperative manifest refraction, which was subsequently measured after surgery. There was one outlier of 2.96 for the correction index, but this was for a cylinder change from −0.25 × 50 to −0.50 × 130. ATLAS average keratometry changed from 42.77 ± 1.87 D (range: 38.50 to 46.50 D) before surgery to 47.45 ± 2.15 D (range: 41.00 to 52.00 D) at 3 months after surgery. ATLAS average corneal astigmatism changed from 1.19 ± 0.74 D (range: 0.04 to 3.90 D) before surgery to 1.31 ± 0.64 D (range: 0.28 to 3.26 D) at 3 months after surgery. Table 2 includes the mesopic contrast sensitivity data before and after surgery showing that there was no change at 3, 12, and 18 cycles per degree (cpd), but there was a statistically significant decrease at 6 cpd. In the current study, we found the refractive and visual outcomes 3 months after SMILE for hyperopia to be promising, particularly after considering the high degree of hyperopia corrected (up to +6.90 D spherical equivalent refraction) and the relatively reduced CDVA in this population. Overall for eyes targeted for emmetropia, UDVA was 20/32 or better in 58% of eyes, relative to 64% with preoperative CDVA of 20/32 or better. The lenticule profile achieved satisfactory optical quality as supported by there being no change in contrast sensitivity at 3, 12, and 18 cpd, and although there was a small but statistically significant decrease at 6 cpd, this was thought to be clinically non-significant. 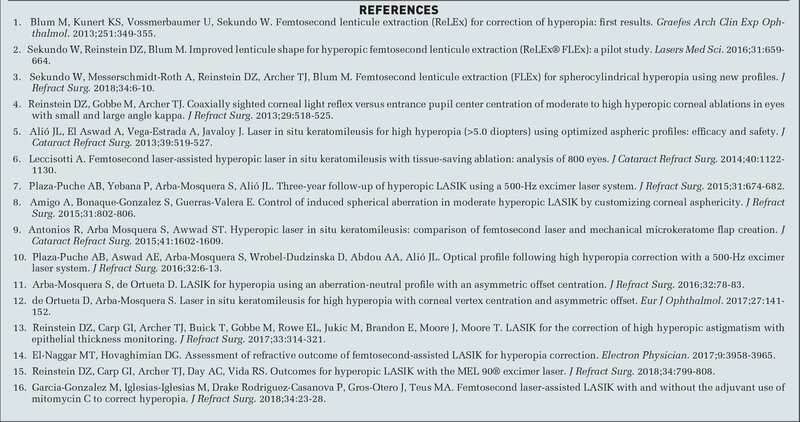 To compare the current study to published LASIK studies in the past 5 years, a literature review was performed using the search terms “LASIK” and “hyperopia” or “hyperopic” in PubMed. 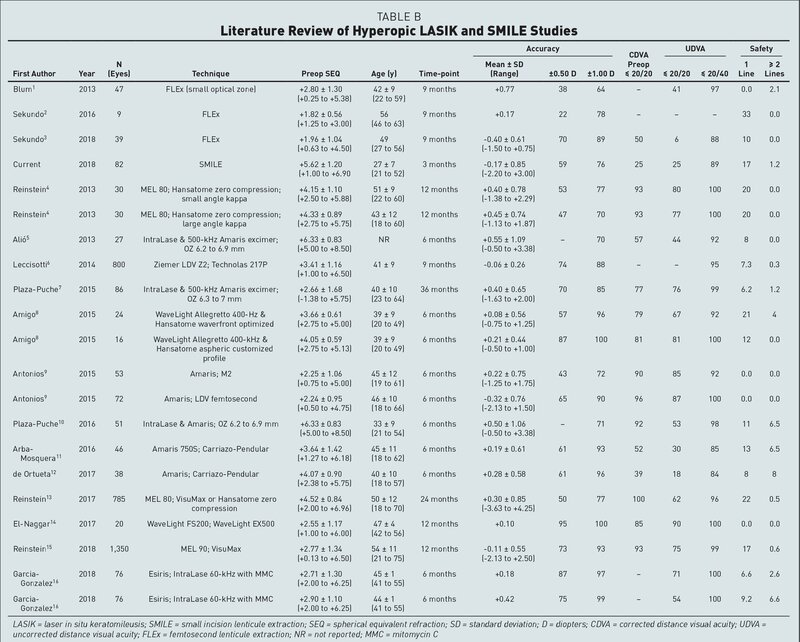 Although there may be relevant studies excluded by the 5-year time frame, a comprehensive historical literature review of hyperopic LASIK was considered outside of the scope of the current study. Stability between 1 and 3 months was similar to LASIK, with a shift in spherical equivalent refraction of more than 0.50 D in only 17% of eyes. Longer follow-up is needed to investigate long-term stability to compare to the change observed after hyperopic LASIK, such as the +0.17 D reported change between 3 and 12 months with the MEL 80 laser.27 It is intended to report long-term stability data for this population in a subsequent study once the data are available. This is of particular interest for the current population given the young mean age and high hyperopia, because there may be latent accommodation. However, the refraction protocol included measurement of cycloplegic refraction followed by a repeat manifest refraction on a separate day with the goal of pushing maximum plus.8 Another weakness of the study is that 3-month data were not available for 12% of eyes, which may introduce some bias. Previous earlier phases of this multi-phase study were to optimize energy settings and demonstrate topographic safety in poorly sighted eyes. Hyperopic SMILE optical zone centration evaluated by topography difference maps was found to be similar to a matched LASIK control group.5 Achieved optical zone diameter after SMILE with a programmed optical zone of 6.3 to 6.7 mm was also found to be similar to 7-mm LASIK and larger than 6.5-mm LASIK. Consequently, the induction of spherical aberration was similar to 7-mm LASIK and less than 6.5-mm LASIK.6 This is important given the well-known detrimental effect of small optical zones and high spherical aberration in terms of regression and quality of vision, as evidenced by no change in contrast sensitivity in the current study. The control of optical zone diameter may be related to the elimination of peripheral laser fluence projection and reflection losses that occur in LASIK28,29 These are particularly important for hyperopic corrections because most of the ablation is peripheral and hyperopic ablations tend to require a larger optical zone and transition zone. On the other hand, these errors are avoided by SMILE because the lenticule is delineated by the femtosecond laser, which is unaffected by the angle of incidence with the cornea. The other difference with hyperopic SMILE is that the lenticule has been designed to be 25 to 30 µm thick centrally to avoid buttonholing the lenticule during interface separation. This may lead to an increase in total tissue removed compared to LASIK, but the overall impact of this should be considered in the context of the achieved topographic optical zone diameter relative to the lenticule thickness/ablation depth. As described above, the achieved topographic optical zone diameter was similar between SMILE and LASIK despite a smaller programmed optical zone diameter for SMILE. Therefore, the ratio of tissue removed to achieved functional zone diameter ends up being similar. Refractive and visual outcomes 3 months after SMILE for hyperopia were promising, given the high degree of hyperopia corrected and relatively reduced CDVA in this population. The slight mean overcorrection would be expected to regress further by 1 year. Undercorrection of more than 1.00 D in 5 eyes might be partly explained by latent hyperopia in these young patients. Blum M, Kunert KS, Vossmerbaumer U, Sekundo W. Femtosecond lenticule extraction (ReLEx) for correction of hyperopia: first results. Graefes Arch Clin Exp Ophthalmol. 2013;251:349–355. Sekundo W, Reinstein DZ, Blum M. Improved lenticule shape for hyperopic femtosecond lenticule extraction (ReLEx® FLEx): a pilot study. Lasers Med Sci. 2016;31:659–664. Sekundo W, Messerschmidt-Roth A, Reinstein DZ, Archer TJ, Blum M. Femtosecond lenticule extraction (FLEx) for spherocylindrical hyperopia using new profiles. J Refract Surg. 2018;34:6–10. Reinstein DZ, Carp GI, Pradhan KR, et al. Role of laser refractive surgery in cross-subsidization of nonprofit humanitarian eyecare and the burden of uncorrected refractive error in Nepal: pilot project. J Cataract Refract Surg. 2018;44:1012–1017. Reinstein DZ, Pradhan KR, Carp GI, et al. Small incision lenticule extraction (SMILE) for hyperopia: optical zone centration. J Refract Surg. 2017;33:150–156. Reinstein DZ, Pradhan KR, Carp GI, et al. Small incision lenticule extraction (SMILE) for hyperopia: optical zone diameter and spherical aberration induction. J Refract Surg. 2017;33:370–376. Pradhan KR, Reinstein DZ, Carp GI, Archer TJ, Gobbe M, Dhungana P. Quality control outcomes analysis of small-incision lenticule extraction for myopia by a novice surgeon at the first refractive surgery unit in Nepal during the first 2 years of operation. J Cataract Refract Surg. 2016;42:267–274. Reinstein DZ, Yap TE, Carp GI, Archer TJ, Gobbe M. Reproducibility of manifest refraction between surgeons and optometrists in a clinical refractive surgery practice. J Cataract Refract Surg. 2014;40:450–459. Reinstein DZ, Gobbe M, Gobbe L, Archer TJ, Carp GI. Optical zone centration accuracy using corneal fixation-based SMILE compared to eye tracker-based femtosecond laser-assisted LASIK for myopia. J Refract Surg. 2015;31:586–592. Shetty R, Shroff R, Kaweri L, Jayadev C, Kummelil MK, Sinha Roy A. Intraoperative cap repositioning in small incision lenticule extraction (SMILE) for enhanced visual recovery. Curr Eye Res. 2016;41:1532–1538. Reinstein DZ, Archer TJ, Randleman JB. JRS standard for reporting astigmatism outcomes of refractive surgery. J Refract Surg. 2014;30:654–659. Alpins N. Astigmatism analysis by the Alpins method. J Cataract Refract Surg. 2001;27:31–49. Reinstein DZ, Gobbe M, Archer TJ. Coaxially sighted corneal light reflex versus entrance pupil center centration of moderate to high hyperopic corneal ablations in eyes with small and large angle kappa. J Refract Surg. 2013;29:518–525. Alió JL, El Aswad A, Vega-Estrada A, Javaloy J. Laser in situ keratomileusis for high hyperopia (>5.0 diopters) using optimized aspheric profiles: efficacy and safety. J Cataract Refract Surg. 2013;39:519–527. Leccisotti A. Femtosecond laser-assisted hyperopic laser in situ keratomileusis with tissue-saving ablation: analysis of 800 eyes. J Cataract Refract Surg. 2014;40:1122–1130. Plaza-Puche AB, Yebana P, Arba-Mosquera S, Alió JL. Three-year follow-up of hyperopic LASIK using a 500-Hz excimer laser system. J Refract Surg. 2015;31:674–682. Amigo A, Bonaque-Gonzalez S, Guerras-Valera E. Control of induced spherical aberration in moderate hyperopic LASIK by customizing corneal asphericity. J Refract Surg. 2015;31:802–806. Antonios R, Arba Mosquera S, Awwad ST. Hyperopic laser in situ keratomileusis: comparison of femtosecond laser and mechanical microkeratome flap creation. J Cataract Refract Surg. 2015;41:1602–1609. de Ortueta D, Arba-Mosquera S. Laser in situ keratomileusis for high hyperopia with corneal vertex centration and asymmetric offset. Eur J Ophthalmol. 2017;27:141–152. Plaza-Puche AB, Aswad AE, Arba-Mosquera S, Wrobel-Dudzinska D, Abdou AA, Alió JL. Optical profile following high hyperopia correction with a 500-Hz excimer laser system. J Refract Surg. 2016;32:6–13. Arba-Mosquera S, de Ortueta D. LASIK for hyperopia using an aberration-neutral profile with an asymmetric offset centration. J Refract Surg. 2016;32:78–83. Reinstein DZ, Carp GI, Archer TJ, et al. LASIK for the correction of high hyperopic astigmatism with epithelial thickness monitoring. J Refract Surg. 2017;33:314–321. El-Naggar MT, Hovaghimian DG. 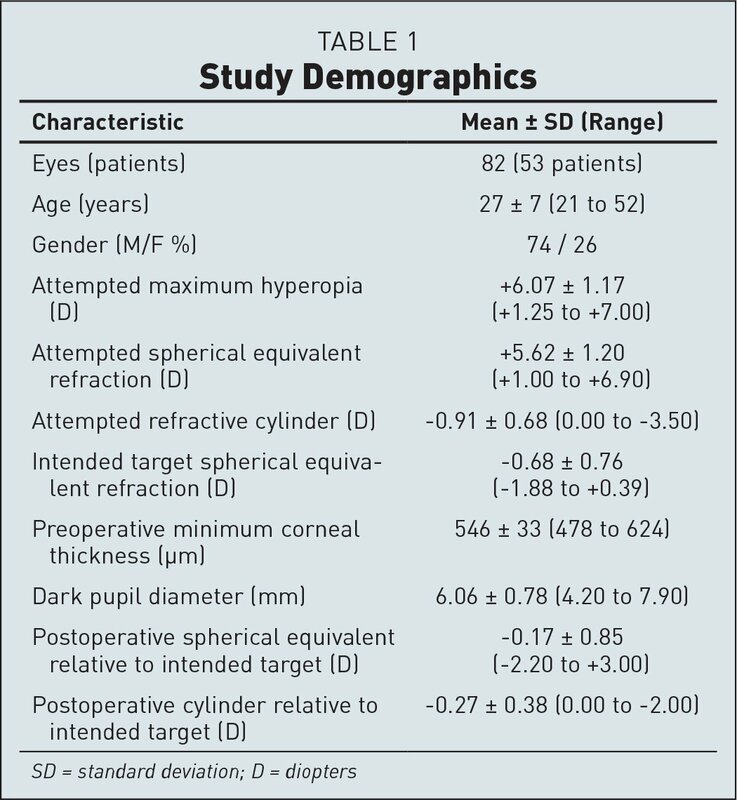 Assessment of refractive outcome of femtosecond-assisted LASIK for hyperopia correction. Electron Physician. 2017;9:3958–3965. Garcia-Gonzalez M, Iglesias-Iglesias M, Drake Rodriguez-Casanova P, Gros-Otero J, Teus MA. Femtosecond laser-assisted LASIK with and without the adjuvant use of mitomycin C to correct Hyperopia. J Refract Surg. 2018;34:23–28. U.S. Food and Drug Administration. Carl Zeiss Meditec Inc. MEL 80 Excimer Laser System (Hyperopia) (PMA). http://www.accessdata.fda.gov/cdrh_docs/pdf6/P060004b.pdf. Accessed October 2018. Arba-Mosquera S, de Ortueta D. Geometrical analysis of the loss of ablation efficiency at non-normal incidence. Opt Express. 2008;16:3877–3895. Mrochen M, Seiler T. Influence of corneal curvature on calculation of ablation patterns used in photorefractive laser surgery. J Refract Surg. 2001;17:S584–S587. From London Vision Clinic, London, United Kingdom (DZR, GIC, TJA, ACD); the Department of Ophthalmology, Columbia University Medical Center, New York, New York (DZR); Sorbonne Université, Paris, France (DZR); Biomedical Science Research Institute, Ulster University, Coleraine, Northern Ireland (DZR, TJA); Tilganga Institute of Ophthalmology, Kathmandu, Nepal (KRP, PD); and the Department of Ophthalmology, Phillips University of Marburg, Marburg, Germany (WS). Dr. Reinstein is a consultant for Carl Zeiss Meditec (Carl Zeiss Meditec AG, Jena, Germany) and has a proprietary interest in the Artemis technology (ArcScan Inc, Golden, Colorado) through patents administered by the Center for Technology Licensing at Cornell University (CTL), Ithaca, New York. Dr. Sekundo is a consultant for Carl Zeiss Meditec. Drs. Carp and Pradhan receive travel expenses from Carl Zeiss Meditec. The remaining authors have no financial or proprietary interest in the materials presented herein.